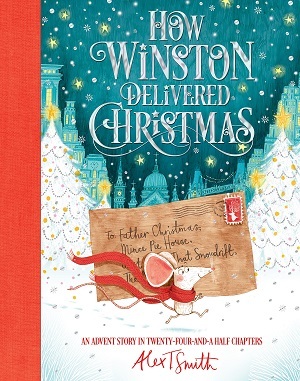 The first book on your radar for Christmas should be How Winston Delivered Christmas by Alex T Smith. This is the most sumptuous book, but a word of warning, you need to give this present early. The neat conceit is that the story has been written in 24 and a half chapters, one chapter to share every day in the lead up to Christmas – ending with a final special story time for Christmas morning. Now, I like advent calendars with chocolate windows, but a book with a story behind every window is even better. The story is about Winston, a homeless young mouse with an important mission, and a special message about the joy of little kindnesses rather than just the material side of the festivities. But more than just a story, there are also activities throughout, such as writing a letter to Father Christmas, making Christmas cards, a recipe for mince pies and so on – all the traditional things a family might do in the run up to the holiday season, but here with a neat tie-in to the story. There are also ideas that might be new – but feel traditional: making an orange pomander, stained-glass window biscuits, and even a pompom robin. Not only are the activities fun, easy and related to the season and story, the story itself combines all the attractive tropes of Christmas narratives – the old-fashioned department store, gingerbread men, a nativity scene, toys and snow. And of course, there’s a happy ending and the lyrics of carols at the end. This is a perfect Christmas book, lovingly produced with a green bookmark ribbon, a fabric spine, and beautiful colour illustrations, through which the warmth of happiness radiates – a lit shop window, a kitchen all a-glow, a dolls’ house, headlights in the snow. Magical and heartwarming. You can buy it here. 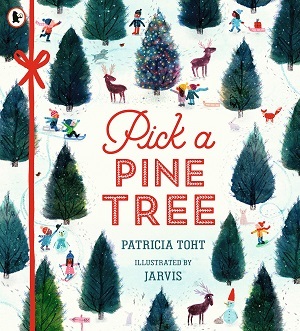 If you’re looking for a picturebook, there is a glut of tie-ins but for something original, Pick a Pine Tree by Patricia Toht, illustrated by Jarvis might tick the box. It’s also suitable for the run-in to Christmas itself, being all about choosing and decorating a tree. It’s unabashedly Christmassy, with nothing held back in its glorious rhyming list of the things needed to turn a pine into a Christmas tree. The text is magical in itself, a gentle rhythm that speeds up with the excitement of Christmas, but the illustrations imbue the book with light and warmth again, whether it’s the brightness of the children’s faces around the tree, or the up-close inside tree drawing of baubles, paper angel dolls and pine needles. You can buy it here. 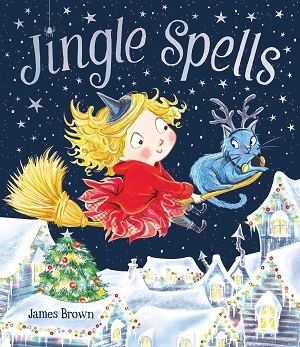 Another book that seems to fall in between the start of autumn and Christmas itself is Jingle Spells by James Brown, a rather delicious mash up of Halloween and Christmas, as Trixie the witch prefers Christmas to Halloween, although her fellow witches think that’s strange, and the Christmas Elves judge her on her appearance and reputation (fearful of tricksy witches). In the end, Trixie helps the elves and Santa get over their winter colds with a warming potion, and they help her to bring Christmas to everyone. Heartfelt, and gloriously illustrated with lots of colour – an emphasis on red and yellow against a blue background helping to bring that magical Christmas warmth again. You can buy it here. Royalty is all the rage at the moment, with a King in waiting, a new baby on the way, and the memory of a couple of weddings this year. But, if you prefer your royalty corgi style, then A Very Corgi Christmas by Sam Hay, illustrated by Loretta Schauer will suit. 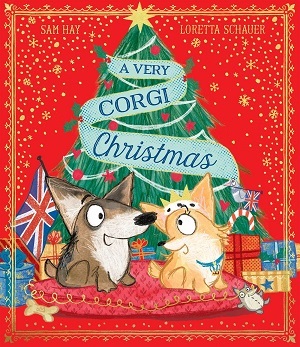 It tells the simple story of the youngest corgi – enthralled with the rush and excitement of Christmas – who gets lost in London and befriended by a more worldly dog. The book works as a paean to London, showcasing an illustration of a dazzling silhouetted London skyline through a window before honing in on the corgi experiencing Piccadilly Circus (a bit too bright for her), a London bus, the London Eye, Big Ben unscaffolded and a London theatre. Even a London litter bin is given central stage. There are plenty of union jacks too – this is a London Christmas to the top of the tree. And of course a happy ending. You can buy it here. 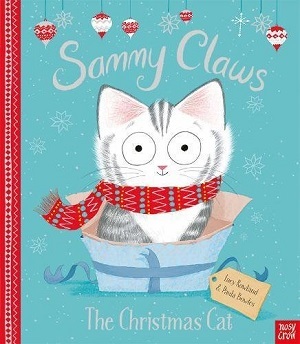 From dogs to cats, Sammy Claws: The Christmas Cat by Lucy Rowland and Paula Bowles understands a cat’s life. Sammy Claws will sleep anywhere, but when he falls asleep in a box on Christmas Eve, he finds himself wrapped in a present and due for delivery with no way of telling Santa of the mix-up. Hiding in his box, Sammy hears of Bad Billy’s and Mischievous May’s plans to steal Santa’s Christmas presents, and finds that yowling fiercely and jumping out can quite seriously shock robbers. This is a delightful Christmas rhyming tale, and although it borrows heavily on other picture books in which canny animals outwit stupid robbers, there is enough dastardly action and colourful Christmassy illustrations to win over every child. At its centre sits a cat with a huge personality. Watch out for smart touches in the illustrations such as Santa’s sleigh goggles, clever rhyming in a bouncy lively text, and the neat ending too. You can buy it here. 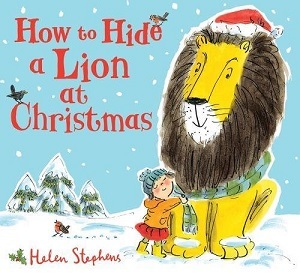 If you do like tie-ins, How to Hide a Lion at Christmas by Helen Stephens retains the magic of the original in this Christmas story of Iris going to visit family for Christmas and being made to leave the lion behind – because he is a little large and might offend their hosts. Many parents have negotiated with children about leaving toys home when they travel, and this is a rather sweet tale of the lion deciding to follow of his own accord. With trains, snow, carol singers and Father Christmas, this also brings to mind old-fashioned Christmases. Stephens has an astute understanding of how to draw her lion to look realistic (reclining on a tree) but also to make him naturally fit within the domestic sphere too – this lion always reminds me of The Tiger Who Came to Tea – I wonder who would get all the Christmas dinner if they were sat at the same table. You can buy it here. If you’re revisiting classics, the key title has to be The Snowman by Michael Morpurgo, illustrated by Robin Shaw. Yes, this is based upon the original story and drawings from Raymond Briggs, but to mark the 40th anniversary of the original picture book, this year the publishers have released a brand new novel. At first you may ponder why such a re-imagining is necessary, but there is a simple continuity in Morpurgo’s version, a nod to modern sensibilities, and an understanding of the gentle care it needs to revisit this classic Christmas tale. 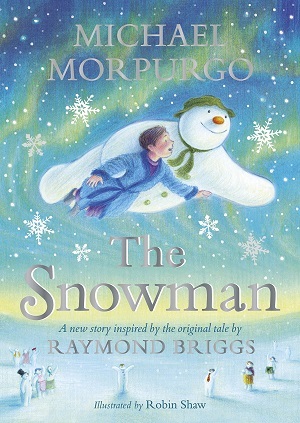 The original Snowman picture book is wordless and doesn’t feature Father Christmas as a character, but Morpurgo has merged the collective memory of the book and animation into his new story, imagining a boy named James with a stutter who takes a magical Christmas Eve flight with his Snowman to a party, where he does meet Father Christmas. In Morpurgo’s version there is the introduction of a Grandma figure, who not only reads The Snowman to James but eventually takes flight with him too. It’s an interesting dynamic to add to the tale, showing the inter-generational relationships that exist, and profiling how James and his grandmother relate to each other. Nice touches include Brussels sprout buttons for the Snowman, and the newly found confidence James develops. I would quibble that some of the Christmas gifts feel dated already, but the gentle tone sits nicely alongside the original. Extras at the back include instructions on how to make the perfect snowman. You can buy it here. 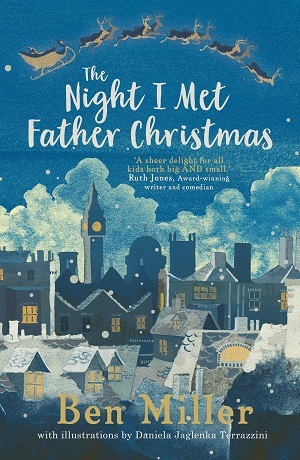 Lastly, The Night I Met Father Christmas by Ben Miller, the comedian, is a mash up between A Christmas Carol and Elf. A small boy with avid curiosity wants to know how Father Christmas became Father Christmas. When he meets him on Christmas Eve, he hears the story from the man (or rather elf) himself – a story within a story format. The tale he recounts is about the elf Torvil, now miserly and mean, who is shown Christmas past, present and future by red-nosed reindeers and magic trees. It’s a pure spin off from Dickens, but told in a spritely jovial way with old-fashioned hot chocolate warmth. As well as the first person narration from the small boy, and the third person narration of Torvil’s story, there are also narrative asides, which seemingly may come from Torvil or the boy, but feel much more as if they come from Miller – hoping the reader never has an accident, waxing lyrical on the joys of sled-rides. It jolts the reader slightly from the narrative, but the whole is so easy to read, so joyful and formulaic (how could it not be, following past, present and future), that it feels familiar and new at the same time. I read an early proof so couldn’t see the illustrations, but the publishers promise illustrations throughout from Danielle Terrazini. Look out for an extract of the book on my blog in early December. You can buy it here. Happy Christmas shopping.